I purchased this Trike about 30 years ago…it was in the garage of a older gentlemen’s house…he was in his 80’s at the time and said that this was a Trike that was in the sears catalog in the 1800’s I never verified any of it. 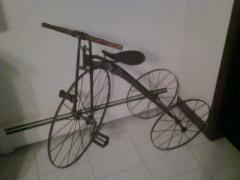 It had a wooden seat and wooden handle bars at the end..the metal appears to be iron. Anyone have any information on this trike?